NETWORK FINALS: NBC’s SUNDAY NIGHT FOOTBALL adjusted to 5.6, down 0.2 from last week’s game. 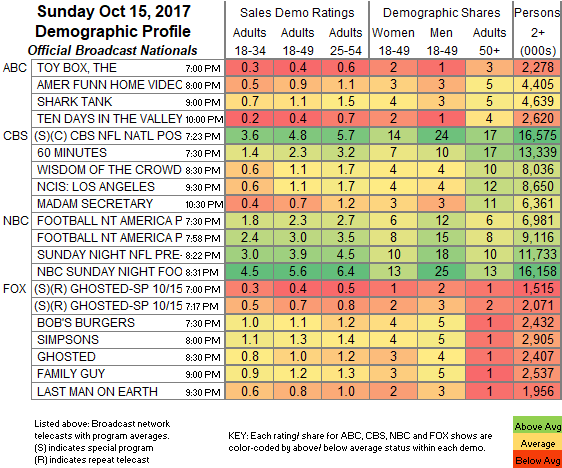 There were also football-related adjustments at CBS, where 60 MINUTES rose 0.1, but WISDOM OF THE CROWD and MADAM SECRETARY lost the same. In addition, ABC’s AMERICA’S FUNNIEST HOME VIDEOS gained 0.1. CABLE HIGHLIGHTS: On a busy night for entrances and exits, AMC’s FEAR THE WALKING DEAD scored 0.80 for its 2-hour season finale, down quite a bit from the Fall 2016 1.59/1.26 season finale (which was rated as 2 separate hours), although up 0.02 from this season’s premiere, and up 0.03 from last week. The TALKING DEAD lead-out was at 0.29, down 0.23 from 2016 but down just 0.01 from last week. On TNT, GOOD BEHAVIOR returned at 0.19, down 0.09 from the official series premiere, but up 0.05 from its “sneak” 2 nights earlier, and up 0.02 from the season finale. On Showtime, after RAY DONOVAN slipped 0.03 to 0.25, WHITE FAMOUS premiered with 2 episodes at 0.06 and 0.04/129K (the first episode had been available via streaming and VOD). On Starz, SURVIVOR’S REMORSE aired a 2-episode finale at 0.08/0.08, down a whopping 0.33 from the season premiere (which ran after POWER), and also down 0.24 from the 2016 finale (also after POWER). On Adult Swim, SQUIDBILLIES returned at 0.49. On HBO, LAST WEEK TONIGHT was steady at 0.43, CURB YOUR ENTHUSIASM ticked up to 0.40, VICE PRINCIPALS gained 0.04 to 0.30, and THE DEUCE ticked down to 0.26. Unscripted was dominated by TBS’s NCLS game at 1.94. 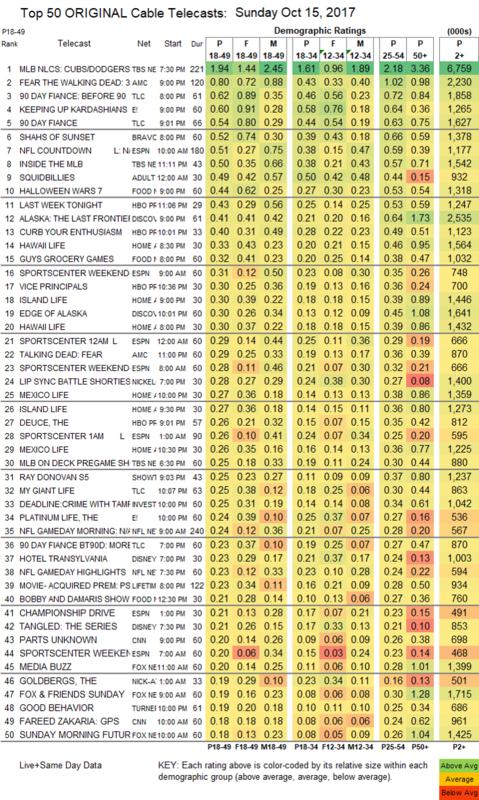 On TLC, 90 DAY FIANCE was at 0.62/0.54, compared to last week’s 0.58/0.49, and MY GIANT LIFE ticked down to 0.25. On E!, KEEPING UP WITH THE KARDASHIANS fell 0.05 to 0.60, and THE PLATINUM LIFE was at 0.24. Bravo’s SHAHS OF SUNSET climbed 0.04 to 0.52. On Food Network, HALLOWEEN WARS gained 0.04 to 0.44, and GUY’S GROCERY GAMES was steady at 0.32. On Discovery, ALASKA: THE LAST FRONTIER rose 0.06 to 0.41, and EDGE OF ALASKA was up 0.04 to 0.30. HGTV’s line-up was led by HAWAII LIFE at 0.33/0.30, compared to last week’s 0.25/0.25.